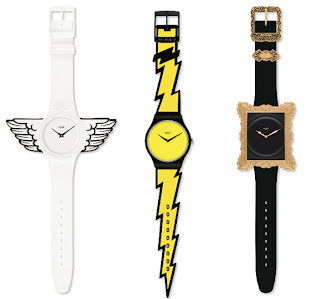 Im a fan of Jeremy Scott's Pop-Art esthetic and the colabs he's done so far have been pretty awesome. So obviously I'm feeling his new collaboration with Swatch. I'm not a fan of watches overall and haven't worn one for years but when I saw the frame design, I soon found myself coveting it. The best part about the designs is that the frame and wings are removable, so the watch will stand the test of time (and they're only £42.50). Have a look at the official site here.